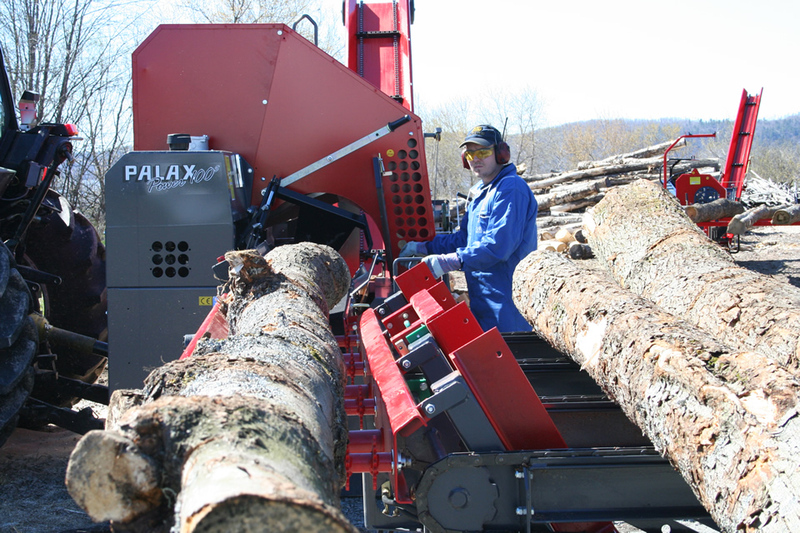 The Palax Power 100s is a firewood processor designed for professional use. 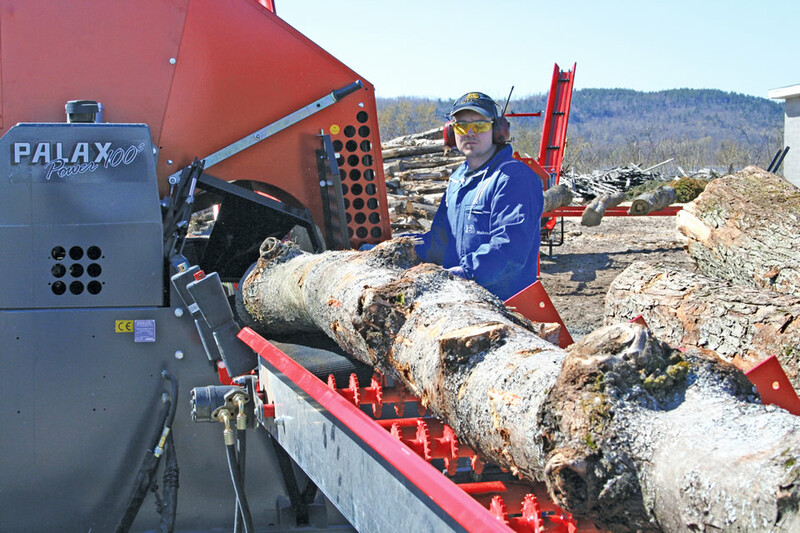 It includes several unique proprietary features that make it the most efficient, productive and reliable machine of its size for processing big trees. 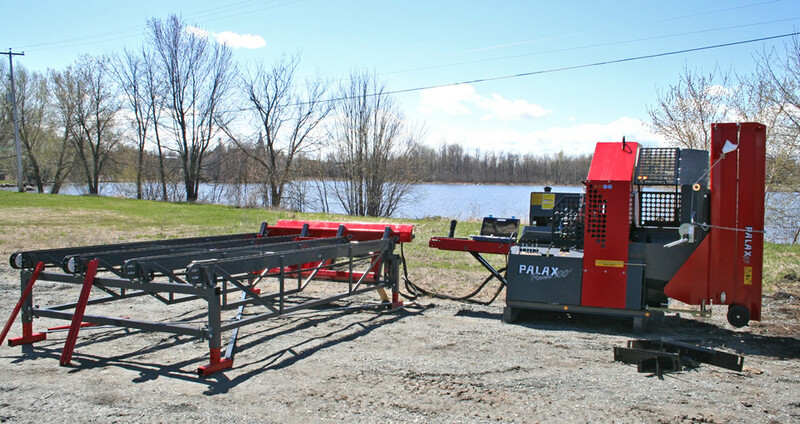 The robust Palax Power 100s is equipped with a 1000 mm / 39.3 in overhead hard-metal blade, a thrust force of 16 tons (kg) / 35 300 lbs and fully hydraulic control. The machine is at its best when processing hardwood. The maximum tree diameter is 40 cm / 15.7 in. Automatic high-speed valve - As a rule, the work stroke is always performed at high speed. If the smaller splitting force induced by the high-speed function is great enough, the wood will split up. If the splitting force at high speed is not great enough, it will immediately be boosted. 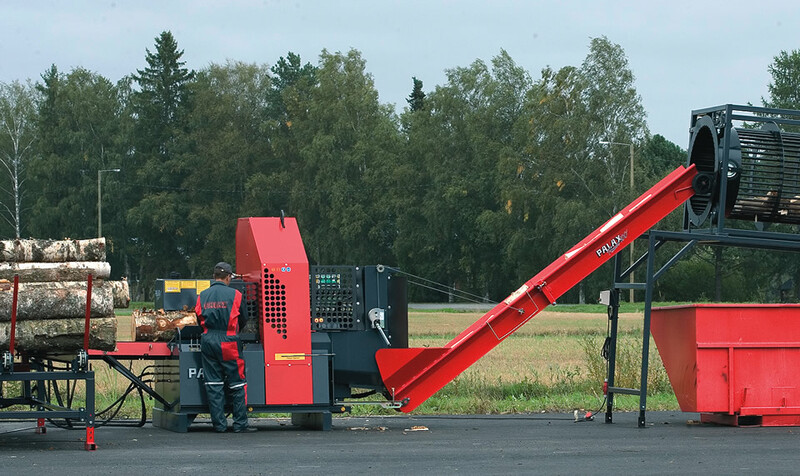 As soon as the splitting of the wood starts and the force requirement is reduced, the high-speed operation will automatically resume. The high-speed motion brings added speed for small trees and added force for big trees. Optimizing the stroke length increases the splitting speed - The Palax Optimi is the method for optimizing the length of the splitting stroke by limiting the cylinder stroke in accordance with the length of the processed wood. A full stroke is used for processing longer sized wood. If the length of the processed wood is shorter sized, then the cylinder stroke is reduced to almost a half and thus the splitting speed is virtually doubled! Automatic tightening of the V-belts - The transmission drive belts of the Palax Power 100 are equipped with automatic tightening. Automatic tightening of the belts completely eliminates the need for repeated retightening of the belts or malfunctions due to slack or too-tight drive belts. Keeping the belts at the correct tightness greatly extends the service life of the belts and the entire transmission. Long service intervals - increased productivity - Lubed-for-life ball bearings in all the control levers make operation of the machine precise, reliable and long lived and extend the service intervals. Flow of hydraulic pump at 500 r.p.m. DISCHARGE CONVEYOR 350 mm x 4300 mm / 13.8" x 169.3"
350 mm x 4300 mm / 13.8" x 169.3"
Maximum diameter of the log: 40 cm / 15.7"
Cutting length of the log: 25 to 55 cm / 9.8 to 21.6"